Machine pieced top of squares of part jumpers, most hand knitted. The padding is a blanket. The backing is an old curtain. 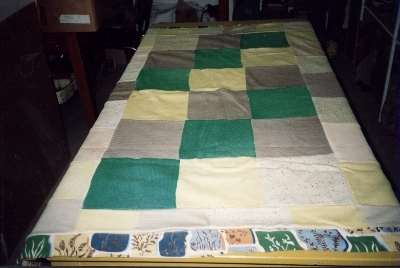 Helen Walker made this quilt in Albury NSW in 1950. It was used continuously on various beds in the house from 1950 until 1985 when it was donated to The Pioneer Women's Hut. The pieces were cut from jumpers Helen knitted for herself and her children. It is now displayed occasionally at The Pioneer Women's Hut.